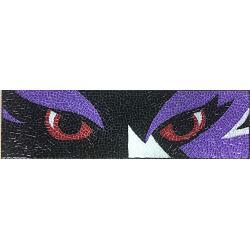 Ravens Eyes is a piece created by Rich Wilkens. He is from Maryland and also works at Maryland Mosaics. This piece was made using our Crystal tiles, Metallic Crystal tiles, Glitter tiles, Eco recycled glass tiles, and 4 color hand tinted grout. The dimensions of this piece are 36.5" x 10.5". Shipping charges on this item will be billed separately.